Lock in a great price for Grand Sarai Nafplio – rated 9.3 by recent guests! Breakfast was fine - don't like mini wieners for breakfast. Other than that, the spread was fine. Great location, comfortable rooms, good breakfast. Extremely polite and friendly staff, nicely renovated historic building in a central and quiet location, comfortable bed and tasteful style in room decor, great breakfast. Excellent staff and property. Very clean and well run. Staff went out of her way to make is comfortable and help us. Breakfast was superior. I would recommend this to absolutely everyone! We enjoyed our stay here and especially liked the comfortable bed and pillows. The Staff were very helpful. The decor was lovely and the breakfast plentiful. This is a fantastic hotel. The rooms are spacious and clean. The staff went the extra mile to make sure that I had everything that I needed, particularly Ioannis. He was a pleasure to talk to and helped me learn about the culture of Nafplio. 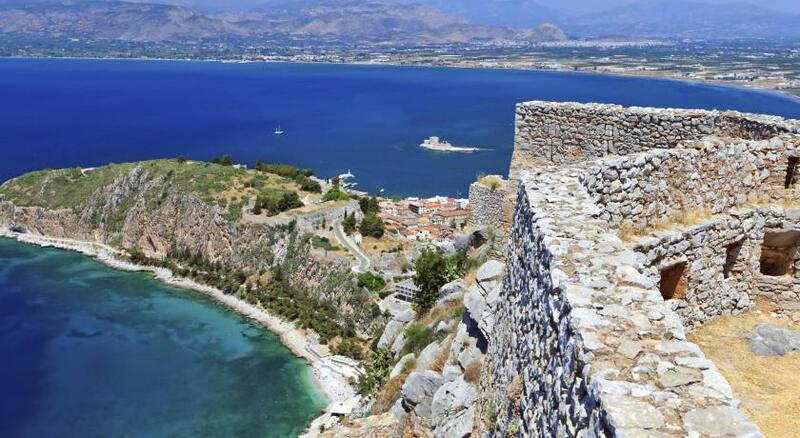 I plan on sending my parents to Nafplio in the near future and they will definitely be staying here. Service was exceptional. Location of the hotel was good. The room was small but comfortable. 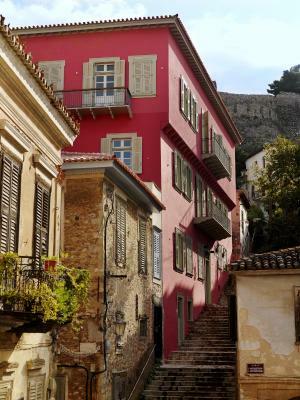 Love Nafplio, my favourite town in all of Greece! This hotel is perfect right in the town, can walk everywhere. Fabulous property, comfortable bed, awesome breakfast and extremely accommodating staff. Excellent and very quiet location. Perfection! Grand Sarai Nafplio This rating is a reflection of how the property compares to the industry standard when it comes to price, facilities and services available. It's based on a self-evaluation by the property. Use this rating to help choose your stay! One of our best sellers in Nafplio! 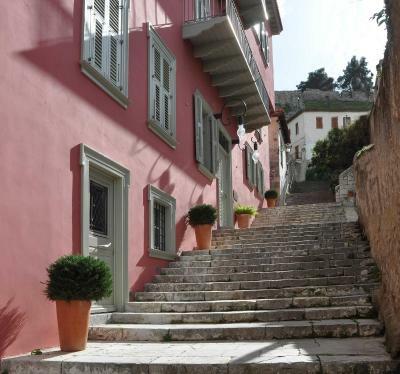 The Grand Sarai is located in the Old Town of Nafplion, right opposite the Catholic Church. Former first Court of the Modern Greek State, it currently houses a breakfast room, restaurant and bar. Fitted with COCO-MAT beds, sofas and linen, The Grand Sarai offers light rooms with panoramic views of the Gulf of Argolis, the Old Town and Palamidi. Each has a safe, LCD TV, mini-bar, internet connection and telephone line. Each includes a fully equipped private bathroom. Their outer window frames are characteristic of the local traditional architecture. Breakfast is served in the spacious and light breakfast room, and includes hot and cold dishes, aromatic coffee and fresh juices. A lounge and a bar with atmospheric décor are also featured. Multilingual staff will be happy to offer you information about the city and surrounding attractions. They are at your disposal 24 hours a day. The historic Syntagma Square, the waterfront overlooking Bourtzi and the scenic bars and taverns are all within 5 minutes’ walk. Free, public parking can be found at 50 and 650 feet from Grand Sarai. When would you like to stay at Grand Sarai Nafplio? Elegant room with light modern decor, located on the first and third floor of the hotel. Superior double rooms are located on the 2nd floor of the hotel. Located on the second and third floor of the hotel, this elegant room enjoys views of the Old Town and the sea from its windows. Located on the upper floor of the hotel, the spacious junior suite offers a balcony with a view the the Gulf of Argolis, the Old Town and Palamidi. It is elegantly decorated in light colors and comes with a desk. The room rate is based on 2 guests. A maximum of 4 guests can be accommodated (see Hotel Policies). The premier double room is located on the 3rd floor of the hotel with view over the sea and the Old Town. Located on the 2nd floor and boasting views over the Old Town of Nafplio, this air-conditioned room comes with a flat-screen TV and mini-bar. The private bathroom is stocked with free toiletries and slippers. Featuring a spa bath, this air-conditioned room offer views over Palamidi and the Old Town of Nafplion from the window. It is located on the 2nd floor and includes a flat-screen TV and mini-bar. The private bathroom is stocked with free toiletries and slippers. House Rules Grand Sarai Nafplio takes special requests – add in the next step! Grand Sarai Nafplio accepts these cards and reserves the right to temporarily hold an amount prior to arrival. Please note that baby cots or extra beds are available upon request. Breakfast! Choices not good. Food left warming for ages. Coffee not fresh. Poor quality for price of hotel. Shower did not work properly. Very classy decor. Large comfortable beds. Great location. Lovely staff. Excellent recommendations for dinner choices. Orange juice at breakfast! The description did not give sufficient information about access to the property - either up steps or along a very narrow road in the old town at a dead end with very limited parking and turning space. Restored historic building with views over the old part of town; excellent room and very comfortable bed. Very courteous and helpful staff. The hotel is very nice but the bathroom want not convinient at all. the hotel is a renovated building that sits across from a catholic church. it's about two streets up (some stairs) and somewhere in the mid point of East and west of the old town where one can park his car. if you are with lots of luggage, there might be a bit of a haul for you. Great views to the old city, comfortable and clean room, very well heated and ventilated. Location perfect! Lovely property and lovely large room. Friendly staff - very helpful. Lovely tasty breakfast. Water replaced daily and welcoming wine and juice - thank you. Loved our stay. A very well maintained mansion with the rooms done up very elegantly - right in the middle of the old town of Nafplio - it was such a pleasure to discover this hotel under the bastions of the old fort. Breakfast was also included in the price and it was very very presented and the server was ever so polite and friendly. This is certainly a place to come back to!! Location - hard to get to - had to drag luggage up many steps, well 10 or 12 - to the entrance. Would have been nice to know that beforehand.